Introducing Our New "Kiss Me!" Lipstick Pouch! Having three daughters running around in this lovely house of mine is the greatest thing because I have always been a bit of a girlie girl and so are they. I don't even want to show you my kitchen table but let's just say, where most people have salt and pepper, I have bottles and bottles of nail polish. My oldest daughter (17) was the one who told me I should take the watercolor of the lips I painted and put them on a pillow...well, she was right, as that pillow landed on the TODAY Show...ha ha...so I've just been running with it. 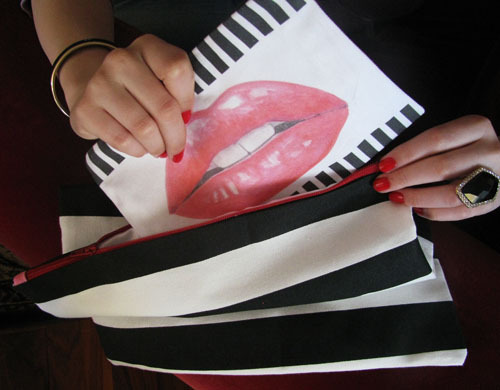 Adding to my Kiss Me Collection, we are introducing our NEW Kiss Me Lipstick Pouch! I love little pouches that I can use to separate things in my purse and because my lipstick always seem to get lost in the bottom of my purse, what better than this?!?! It's now available in my shop and makes a super gift!!!! Muah!